This year’s ESTAL Congress took place on 17th – 18th September 2015 in Porto (Portugal). After Munich in 2011 and Krakow in 2013, the ESTAL Congress 2015 was again a success. Organised together with Portuguese national association APAL, the congress attracted 130 delegates from 16 countries in Porto. Under the right conditions, Europe’s aluminium industry can flourish. At present, however, factors such as increasing electricity prices and burdensome regulations threaten EU plants. The European Commission is therefore evaluating how to address these challenges and ensure a brighter future for aluminium production in Europe. Over 120 delegates from more than 20 countries all over the world, gathered for 2 days at the Sheraton Hotel in Krakow last September to meet for the 40th ESTAL congress. The focus of the congress was on how to prepare aluminium for the future. The European association for Surface Treatment on Aluminium , the platform for all surface treatments and applications of aluminum on a European level, continues to attract different branches and is geographically expanding. “High time to bring our Logo up to date” says Ivo Vermeeren, the Belgian President of the association. 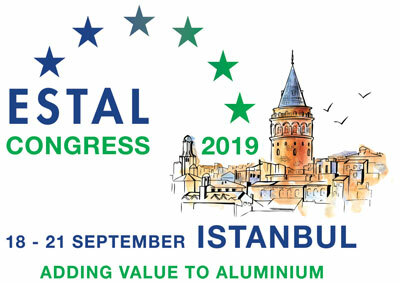 ESTAL represents the aluminium finishing industry in Europe. For ESTAL representation means standing for the shared interests of a modern economic sector with innumerable future prospects. Estal special guest at the ALFED 50th anniversary gala dinner.